In December 1940, the magazine Le Petit Echo de la mode wrote: "The year about to begin, gives us hope that it will see the return of our prisoners, that thought helps us to live as if they were present. The house waits in good order. Similarly large and small, always coquettishly dressed, are ready to receive them." 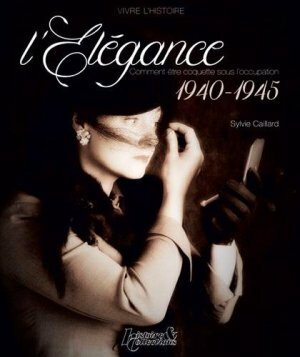 This book is an approach to women's fashion during the occupation between 1940 and 1945. Made from magazines and catalog of the time, extensively illustrated with over 500 photographs and illustrations, this book is meant to be educational, and you will understand in a clear manner, the restriction of style of the time. The first part is devoted to the wardrobe of coats to the shirt through the tailors. In the second part, the accessories are covered: hats, shoes, underwear, bags, and jewelry. Finally, the third part deals with the development of cosmetics: the makeup and hairstyles. A reference for all of the passionate fashion collectors. And for you ladies, who do reenactments, to be elegant in any occasion.